DiskMonitor automatically enumerates available networks and allows you to select disks to monitor and shares to iterate (admin access required). Critical and warning thresholds can be configured. When the thresholds are crossed, DiskMonitor can send a detailed message, a PDA friendly message, or a user defined message. DiskMonitor can also generate directory usage reports that can be generated on a user defined schedule and emailed. System administrators can also configure DiskMonitor to generate directory usage reports. Each report can be generated on their own schedule and results emailed. 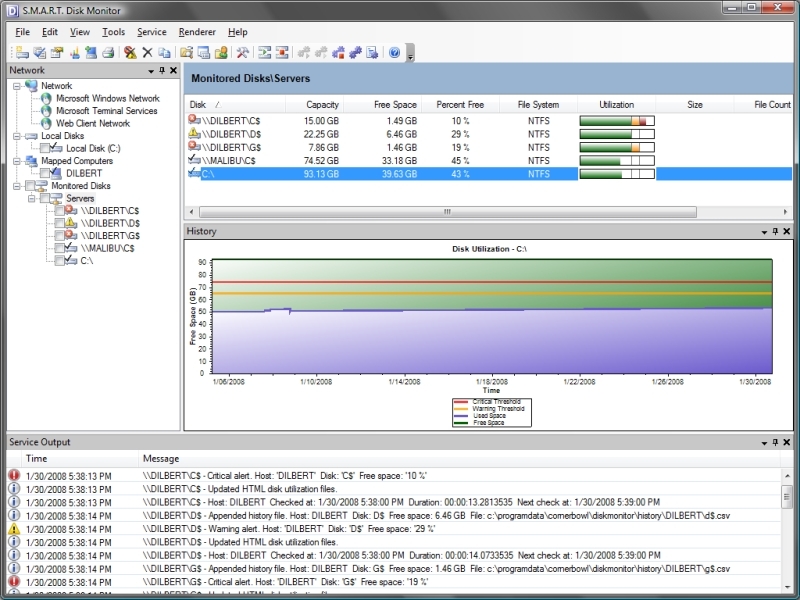 DiskMonitor can also be configured to append disk usage information to a file enabling system administrators to view usage graphically over time. The user interface enables system administrators to sort disk or directory usage by name, size, or number of files. Qweas is providing links to DiskMonitor 5.0.0.12 as a courtesy, and makes no representations regarding DiskMonitor or any other applications or any information related thereto. Any questions, complaints or claims regarding this application DiskMonitor 5.0.0.12 must be directed to the appropriate software vendor. You may click the publisher link of DiskMonitor on the top of this page to get more details about the vendor.